Did you get a card that looks like this? I’d love to hear from you about how the card fared in the mail. Did the spots get scratched in the postal machinery? Did any of the spots fall off (there should be 25)? Also, I’d love to hear any feedback you have about the card. Is there something that can be done to improve future versions? Would you like to get future postcard experiments? If so, mention that in the comments, too. The Advent Postcard arrived today. It arrived in pretty good condition, with only a small back smudge in the left corner (I wanted to post a picture but I can’t figure out how). 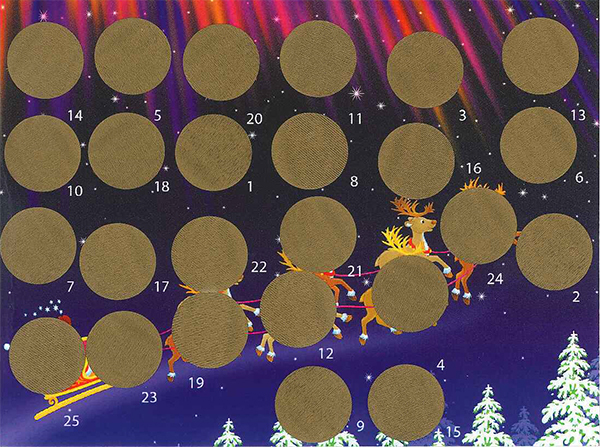 I really liked the Advent Calendar as an early Christmas Card for friends. I might even send them! LOL. Well I enjoyed the experiment. Is there anything else you need? Thanks, Susie! Sounds good. That’s pretty much all I needed for this one. I may have future “experiments. Can I keep you on the list for future tests? I received the card today, 9/24/2015. Structure wise it is in great shape. No water damage, folds, etc. there is black marking on number 15 circle and the number 15 which was white is now faded pretty good, prob from post office machine. Small black marking on 8 and 21. Hardly noticeable. All gold coloring is on the circles. None came off. All in all the card traveled well via the postal service!! Observation … Maybe there is a reason your numbers aren’t next to their circle but it is hard to follow which number goes to which one. Maybe this is a printing thing? I would suggest putting the numbers next to their circle or maybe you can put the number on circle itself? I enjoyed participating. Looking forward to scratching them off! I really wanted to do it to one just to see how easy/hard it would be. You are correct on the numbers bit. The circles are stickers, and they are smaller than I expected them to be, which meant that things got more off, in terms of where things got covered and such. In general, it doesn’t really matter much which circle goes with which number, just one a day is fine, but I do like the “finding” aspect of putting a dot with a “correct” number. I tried to be as consistent as possible, and the number is usually to the bottom right of the circle. In this version, they’re done by hand as individual stickers, and they weren’t part of the printing. I may be able to find a printer that can stamp scratch spaces in specific places, but, that is undoubtedly more expensive. The printer may also be able to put the number on there. I just know that going with a specialty printer, I’d be shelling out much more money than I currently have, so, this was essentially step one, to see if it works, and if there’s something of a market there to have them more professionally printed. On the scratching part, my, um “testing” is that you want to use relatively gentle scratch, but, use something other than a finger nail to start them. Once it’s started, your nail will work ok. Thanks for the reason behind the number, Kate! The idea and concept behind it all is fantastic! What a great ways to share the Lord. Thanks for the tip on scratching the sticker. Will do! It got here yesterday, Sept. 22. No problems apparent, gold a bit scratched but still sufficiently intact to work. I like the idea. The irregularly placed numbers actually add to the intrigue and interest. Postcard arrived. Looks great. All spots accounted for, no scratches. I am just amazed at how you got the chocolate under each one. Yummm! Got the postcard in on Friday. Looks in pretty good shape except for the upper left corner scratch.